Invite friends round for an Italian evening! Throw a red gingham cloth over your table, light some candles, pour the chianti, and serve up some delicious Italian food. Or watch The Italian Job (the original version of course!) while eating dinner on your laps. The menu we've suggested doesn't involve any expensive ingredients or complicated recipes. And much can be prepared in advance, allowing you to enjoy the company of your guests. Cut the tomatoes in half and, using a teaspoon, scoop out all the seeds. Roughly chop the flesh and place in a bowl. Add the basil, sugar and oil and mix well. Leave to marinate for 20 minutes or until you're ready to serve. Meanwhile lightly toast the bread on both sides. Cut the garlic clove in half and rub the cut edge over both sides of the toast. 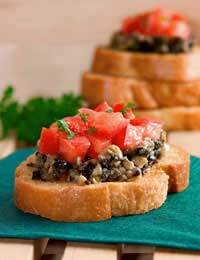 Just before serving, share the tomato mixture between the slices of toast, pressing down lightly. Drizzle any oil left in the bowl over the tomatoes. Serve immediately. One slice is probably enough for an appetizer but you may want to make extra to offer hungry guests! Instead of spaghetti, give gnocchi a try for your main course. You can buy it ready-made if you prefer but here's a simple recipe. Fill a saucepan with cold water. Add 2 teaspoons salt and the unpeeled potatoes. Bring to the boil and cook for about 20 minutes or until tender when squeezed. Drain the potatoes and peel. Use a tea-towel to protect your hands! Mash, grate or press through a sieve. Quickly add the egg (the potatoes should still be warm). Stir in a large pinch of salt and a sprinkling of freshly ground pepper. Add two handfuls of flour and mix. Turn the potato mixture out onto a wooden surface and add the remaining flour. Work with your hands to create a soft dough. Break off a handful and roll it on the surface with your hands until you have a long thin (about 3 cm thick) snake. Cut it into 2 cm pieces. Have a pan of boiling water, with 3 teaspoons salt, ready and add the gnocchi. Cook for 2-3 minutes. It is ready when it rises to the surface. Drain well and serve mixed with a sauce of your choice, and sprinkled with parmesan. This makes enough for 8 people. It can be frozen and re-heated from frozen in about 6-7 minutes. Use your favourite Bolognese sauce. For vegetarians, melt a tablespoon butter in a pan and add about 100g spinach. Allow it to wilt - only takes a minute or so - then remove from pan and drain in a colander. Place 200g mascarpone cheese in a saucepan with 200 ml double cream. Bring to the boil and stir in 70g parmesan. Mix in the spinach and serve straightaway. For a very basic tomato and basil sauce, fry a finely chopped onion in olive oil until soft. Add a tin of tomatoes, 1 tablespoon tomato puree, a good pinch of salt, some freshly ground black pepper and a pinch of sugar. Bring to the boil and simmer for 20 minutes. Add a handful of roughly chopped basil leaves. Heat through and serve with parmesan for sprinkling. Using an electric mixer if possible, whisk together the egg yolks and sugar until you have a thick creamy mixture. Put the cheese in another bowl and beat it slightly to soften then gradually beat in the egg mix. Cover this layer of sponge fingers with half of the cheese mixture. Sprinkle over half of the grated chocolate. Repeat the process with the remaining ingredients. Dust with cocoa powder. Cover and chill for 3 hours before serving. Use a glass serving bowl if you have one so the layers can be seen. An alternative is to use 6 large or 8 smaller individual glasses.